Looking for some FREE, family fun to kick off Spring Break??? You don’t want to miss the 7th Annual Urban Forest Festival at the Outdoor Activity Center on Saturday, April 6, 2013 from 11 am – 4 pm. 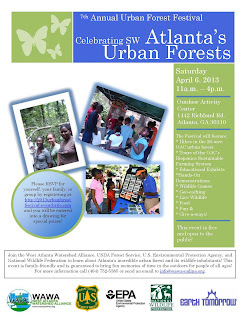 WAWA, the USDA Forest Service, U.S. Environmental Protection Agency, and the National Wildlife Federation invite you to celebrate Southwest Atlanta’s urban forests at this FREE, fun-filled event. 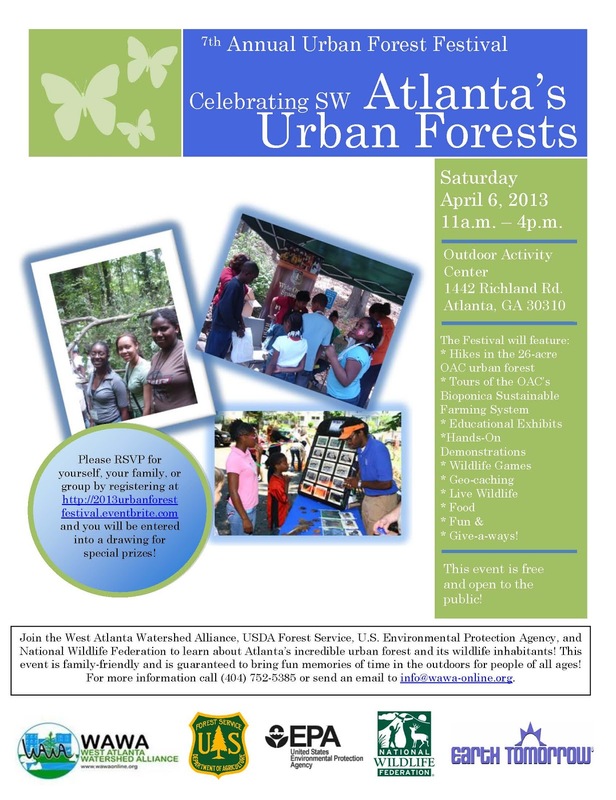 Families are invited to learn about Southwest Atlanta’s incredible urban forests and their wildlife inhabitants. We’ll have educational and entertaining exhibits, live wildlife, guided hikes and tours of the 26-acre OAC urban forest, food, giveaways, and hands-on activities and demonstrations by WAWA, NWF’s Earth Tomorrow Program, the USDA Forest Service, and other partners. Plans also include playing forestry and wildlife games, making fun crafts, and learning outdoor skills. This event is a great way to kick off Spring Break! The Outdoor Activity Center is located at 1442 Richland Rd. S.W., Atlanta, GA 30310. For more information, call (404) 752-5385 or send an e-mail to info@wawa-online.org. to be entered into a special drawing. You must be present to win. © 2016 West Atlanta Watershed Alliance.